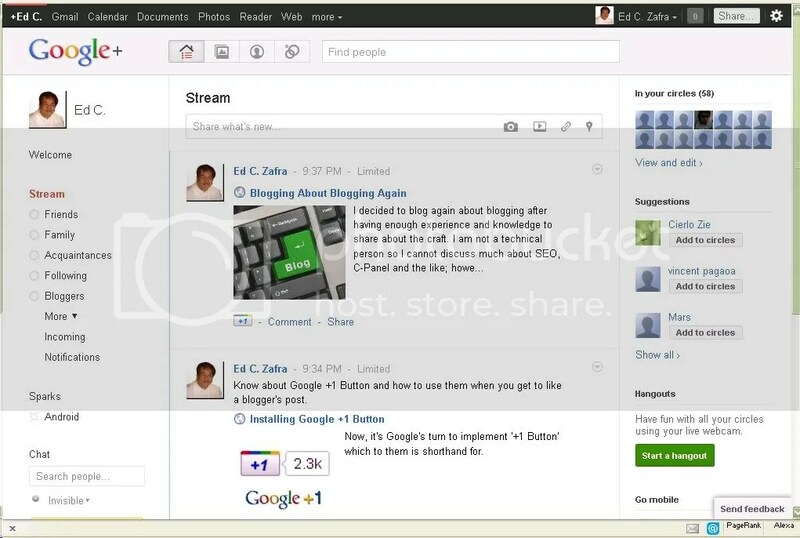 The other day, I received an email informing me that one of my sons invited me to join him on Google+ project. The message does not have any ‘Accept’ nor ‘Deny’ link and I cannot remember anymore what I did to create my account with Google+ project. The welcome page on my account says I am a part of a small group of people who are helping to test Google+ and that when I share something with people who are not yet able to use Google+, they will receive it via email but won’t be able to comment or engage with the content like the invited Google+ testers. I proceeded to set-up my Google+ account beginning with my ‘Circles’ (see description below) until I was able to post something on my ‘Stream’ (similar to Facebook’s Wall) which I captured and uploaded here so you would see how it looks. I also researched for more information about Google+ which everyone I’ve read believed to be Google’s latest and biggest bet against Facebook, the current social networking giant. Circles – Instead of having ‘Friends’ in just one (1) group like in Facebook, you can create as many groups (called ‘Circles’) as you like in Google+. As such, you can share information (photos and videos) selectively. So with Circles, you share one thing with college buddies, another with parents, and almost nothing with your boss. Sparks – This application will allow you to keep track of the latest web information about your areas of interest which you can immediately share to your circles. Hangouts – This is an on-screen gatherings of people on the same circle using multi-person video conferencing. Hangouts lets you stop by when you’re free, and spend time with your Circles. There are many more social applications at Google+ and from the looks of it, Google is really making a bold move with Google+ to grab a share of the social networking crowd and based on the little that I’ve seen so far, this is by far the best effort that Big G has put out for the effort. However, even with its size, Google is not certain that it would get what it wants. We must note that Facebook seems well-entrenched in the social niche but who knows what else Google has to offer. By the way, the welcome note also said the people I added in my circles will only be able to join me at Google+ when Google let more users in over time. If you happen to be also involved in the project as a beta tester and would like to have me in your circles to facilitate our testing, you could leave a comment below or use ‘Contact Me’ above to signify your intention. I’ve signed up but I’m still waiting for Google’s invite. Can you instead invite me please? Thanks for visiting. I am sorry that I cannot invite anyone to join me unless he is already a Google+ member. Google does not allow that at the moment. I also wonder why it is so. The testers could do only very few things because of that. As of now, I have created some Circles using my Gmail contacts but they cannot interact with me at Google+. They only receive emails when I post in my Stream. Google+ is actually useless at the moment. i only have my son to interact with. No problem at all, Edzee. Anyway, I’ll just wait for my official invite from Google then. I’ve read somewhere that Google wants to take advantage of the social networking market where Facebook has the distinct advantage and the first choice among millions of netizens. Of course, for a non-techie like me, I find it difficult to immediately understand the ramifications and the benefits I can derive from it. Of course, I may want to partake anything that may interest in the long run.